Now at 22-months, Ava is really interested in art projects more than ever. When I work from home a couple days a week, we have mornings together before she goes to daycare for a half day. I can easily entertain her by offering her crayons, paint, chalk, colored pencils, or markers. She likes to draw on coloring books, blank paper, and on her art easel. She is obsessed with stars and the moon. 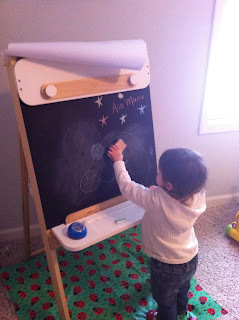 When she draws, she likes to make a big circle and say "moon." It's really cute! We're working on learning colors with her now! As I've mentioned before, Ava's verbal skills are really great! She can say all sorts of words and clearly! Even harder words like caterpillar sound pretty clear. So I tried to work with her on identifying colors. Her favorite color seems to be yellow, which she says "lellow. "Ava usually picks yellow crayons and markers for her projects. "Lellow" is her go-to color that she guesses first when I ask her to tell me the color of an object. She says red, pink and blue really well and green is "geen." I've discovered that if you focus on a new concept like colors from a toddler's eyes, anything can be a tool for teaching. Clothing, towels in the bathroom, cloth diaper covers, stuffed animals, pictures in books, animals outside, cars on the street, or even food at mealtimes can be an opportunity to discuss different colors. Ava's brain is always busy from one activity or thought to another, but when I see her searching for something else when she's restless it's fun to help direct her into something she enjoys. In the bath, we have splash cards that are different colors with objects on the front. They're made out of foam so you can stick them on the bathtub when they get wet. At bath time, Ava and I talk about the different colors and items on the splash cards. Even her cups are different colors, sizes, and decorations on them. I bet there are other parents start looking at every day objects as a multipurpose learning opportunity. It's actually pretty fun!